The liposome research community needs new production tools so that novel designed liposomes of therapeutic use can make it to production. 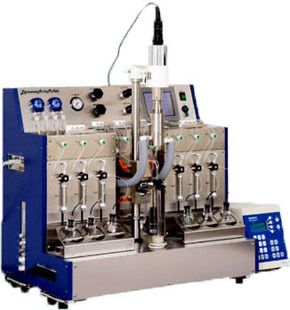 Low pressure vortex mixing and low pressure extrusion present an alternative to high pressure membrane extrusion. 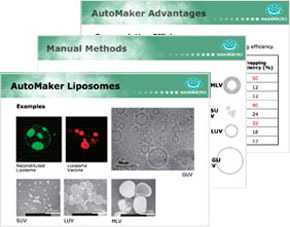 The Hashimoto Liposome Automaker expands the possibilities for liposome process development, production, and scale-up by incorporating orthodox methods within a fully automated configurable system. 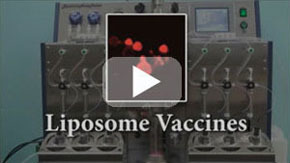 The release of the Hashimoto Liposome Automaker enables a new generation of liposome breakthroughs for the research community. You don’t have to be a liposome expert to make expert liposomes…You can easily manufacture novel liposomes (cationic, pegylated, congugated & heat-activated) with one-touch control over phospholipid mixing conditions. Download Doxil Formulation Protocols using SUV (sonication), MLV (low-pressure extrusion, no sonication) and GUV (micron size fructose formulation extruded to 120nm). Come see us at Control Release Society Annual Meeting!